Have you ever thought about trying something new, but weren’t quite sure if you would be successful? You are always your biggest critic…sometimes. I know that I am full of self-doubt. It took a lot of courage just to start this blog. There was a lot of negative self-talk that happened before I just bit the bullet and did it (and I am so glad that I did). Other times, people looking in from the outside are your worst critic. Someone that does not understand the mental battle you are already going through, unknowingly makes it 10-times worse and you fall completely off the wagon. Some people are just mean and others are naive to your struggle. If I am not completely confident in what I am doing, I am going to second guess myself a million times, and possibly throw in the towel before I even make an attempt. I am a take charge kind of person and am not afraid of grunt work, but I like to know what I am doing, so I do the job correctly. If I am feeling like I might fail at something before it even gets started, then I am not going to put my best foot forward. If I already have it in my head that I can’t do it, I won’t. It isn’t that I don’t want to do said task, but I get in my own head and ruin any chance I have of accomplishing it. For instance, this morning (Friday) we had snatches in the workout. Now, I am not great at this movement, but I can do it decently. I know my weaknesses and strengths very well, which can be a good and bad thing. I worked my way up to a decent weight when we were warming up. Come time for the actual workout, I failed twice on the first round. I got in my head and didn’t try it again. I had just done that weight 3 minutes before the clock started. Once I fail at a weight, it is not likely that I will get it again. Not that I physically can’t, I mentally freeze. If there is one thing that I might really dislike about myself, this is it. I hate that I can’t mentally push past my failures and attack the weight with vengeance. I dropped down in weight and did fine. It was only a 5 pound drop. I hate how 5 pounds can make or break you. There are other times when I want to step out on a limb and go heavier on a workout. Like I said, I pretty well know my strengths and weaknesses, but when someone walks by and makes a comment like ‘are you sure about that’…I am no longer sure about that. Josh on the other hand, will attack the bar with vengeance and show that person that he IS sure and he can do it. I don’t have that mental toughness like he does when it comes to working out. Don’t get me wrong I can hold my own, but when it comes to pushing really heavy weights around, I am mentally weak. I let others get into my head, as well as myself. Something I am mentally strong on is my nutrition. I can go without alcohol, cupcakes, peanut butter, etc. I can keep myself busy enough to where I don’t over eat and I know how to limit myself on sweets. Not everyone has the mental capacity to push the plate away or not pick up the chocolate at the check-out counter. I don’t follow a diet plan, I just count my macros. Maybe that is considered a diet, but I don’t like to refer to it in that way. To me, dieting means I am restricting myself from certain foods. I am restricting the amount of calories I take-in, but I think everyone should know their caloric intake. I can eat anything I want, as long as it doesn’t push me over my allotted calories for the day. Being mentally tough on my nutrition allows me to make smart decisions when it comes planning for a night out. I am not going to have my typical post-workout meal if I am going to have a cupcake with Scarlett for her birthday. I won’t have the kale with my eggs, because that adds extra fat from being sauteed with olive oil, if I am planning on eating a fattier supper. You have to know what you are putting into your body, so that you can accommodate for those special occasions without the guilt. Unfortunately there are those that feel as though their comments about what you are eating needs to be heard. Don’t listen. I don’t walk around giving out unsolicited advice to strangers, friends, or family members. If someone wants helps with their nutrition, they will ask me. When someone makes a comment about how I feed my family or myself, it doesn’t make me second guess what I am doing, like it does when I am trying to use a heavier weight. Like Josh attacks his weight with vengeance, I go on the offensive about my meals. In the nicest way possible, I try to explain that I do eat a lot, that I do eat regular foods, but it falls on deaf ears. Get mentally tough about your “diet”. Stick to your plan and do not deviate because someone makes a comment. When you start weighing out your food or forego the typical Sunday lunch with everyone, there will be comments. They don’t understand your plan, so don’t let their comments get you down and make you start all over again. You must be consistent to see any changes and you can’t let someone’s ignorant comment get in your head. If you don’t make any changes or can’t stay consistent, don’t expect to see any results. 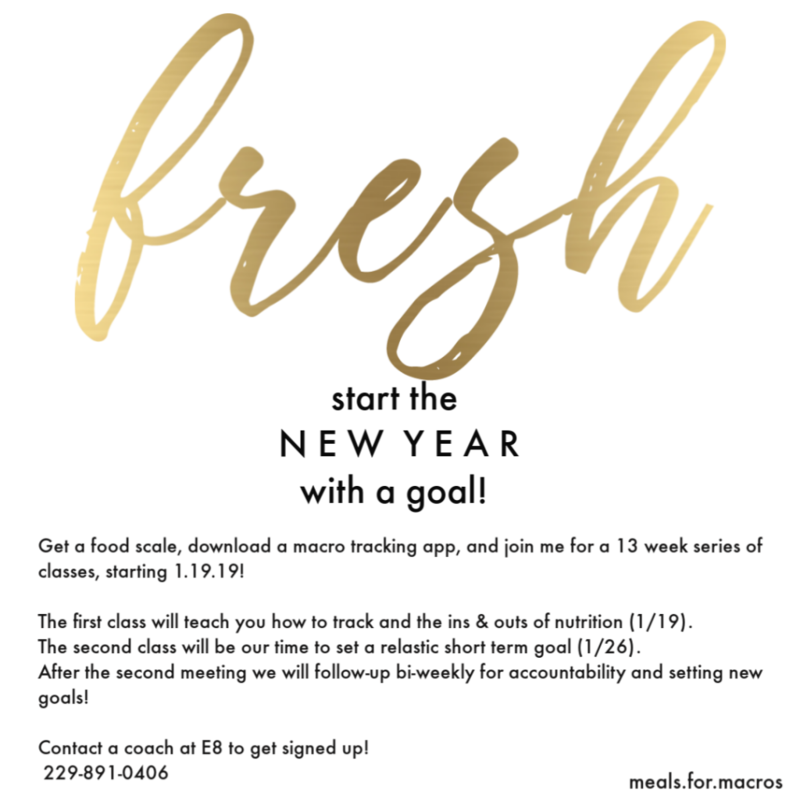 Don’t forget I am hosting a 13 week long class at E8 that will focus on tracking macros, overall nutrition, meal prepping, bi-weekly accountability meetings, bi-weekly weigh-ins, and take you through the process of cutting calories safely. The first two meetings will be on 1/19 and 1/26 at 9 a.m. at E8 ($35 each session). The bi-weekly meetings are $25 each session. If you are interested in taking the class, call and get signed up! The party is over and I have eaten all the cake I can handle, after I eat this downtown cannoli cupcake. I swear we get the best cakes ever from Burke Perk. Sarah-Ann Kelly is truly gifted. 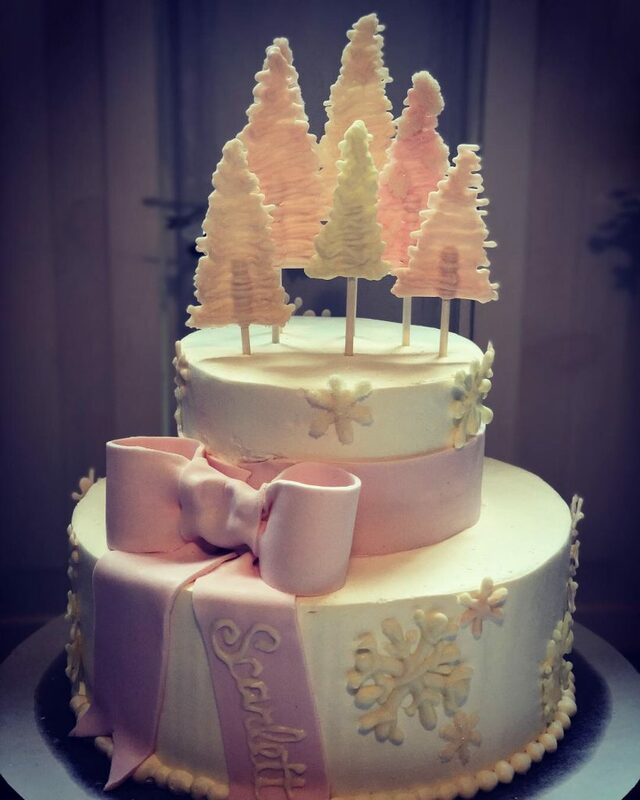 Look her up next time you need a cake. Not to mention, they are gorgeous.. When we got a pork loin last week and we left part of it whole so that we could stuff it. Normally anytime you stuff something, you don’t think it could possibly be healthy, but this recipe is very healthy. I try not to over-do it on the oil when I brown the sides of the pork, so I don’t waste my calories on invisible fats. The eggplant is supposed to be grilled, but I am not lighting the grill just for eggplant. I always opt to cook it in the oven or on the stove. It makes life a lot easier. Eggplant will soak up oil like no one’s business, so make sure you lightly brush it on or spray the eggplant with olive oil. The vinaigrette calls for olive oil, but I am going to skip. I try to find every way possible to not include oil, that just isn’t really necessary. I have not made this soup in a while but it is one of my absolute favorites and not one that I recommend making while you are on a cut. It has a lot of carbs, but man I do love it. I don’t use a rotisserie chicken, because they have a lot more fat and tracking the macros on a rotisserie chicken is a lot harder than doing it for chicken breasts. If you aren’t worried about counting macros go the easy route and buy the rotisserie chicken. This dish is also great with shrimp! I prefer to use chicken breasts though simply to hit my macro count on protein. If you are tracking your food, I would suggest that you cook your noodles separately. It makes weighing out the food so much easier. The kale is a bit tricky, because it all sticks together in one big clump so you have to work at it to evenly distribute it. Also, make sure you get low-fat coconut milk. It tastes just the same and a lot less added fat! I am not one for measuring my seasonings. I am very heavy handed when it comes to seasoning my meals, except for salt, I do not like salty food. When I made this dish a few weeks ago, I was too heavy handed and it ended up being pretty spicy. I added some jasmine rice and it fixed it right away. Half-baked Harvest uses some bread with this soup, but I really liked it with the jasmine rice. The only change I make to this dish, is I spray my chicken with olive oil then season. Then I spray the pan. I don’t use 1/4 a cup of olive oil to make this work. So I had all intentions of making this bowl this week. I love this bowl, but after cleaning (still cleaning) up from the party I decided to just use the vegetables and seasoning from this recipe and call it a day. I do love a good bowl, but I didn’t want to make the tahini dressing that does along with it. Sometimes, roasted vegetables are just all you need. Not to mention with this cut coming up, I feel as though I need to mentally prepare not to have the little extras, like tahini dressing. Side Note: I am adding pork chops with the vegetables. If you do make this bowl make sure you make the dressing and don’t forget to weigh out the dressing. I am going to use lemon juice instead of olive oil when I season my vegetables as well. This chicken salad is a caloric deficit dream. There is no way you can over expend your calories when you are eating this wrap. It does require a lot more seasoning than what the recipe calls for though. It is a much healthier alternative to mayo filled chicken salad, but you have to work a little magic when making the “mayonnaise”. I like to add cayenne, smoked paprika, oregano, salt, and pepper to my mayo before I add it to the chicken. I boil my chicken, so it is very bland and needs a lot of help. If you are firing up the grill, throw your chicken on there or put it in the oven. Boiling my chicken just makes my life a lot easier…it is boiling now as I type this. I make sure to get a low carb, high fiber tortilla, pack it full of chicken salad, and top it off with a drizzle of sriracha before wrapping it up. I have eaten this without the wrap and it tastes fine. No one wants to see you eating a chicken salad wrap at a math meeting, so just keep the meat in your container and make sure you add a little sriracha with every bite!